“What is taking place (in Syria) is neither a revolution, nor a spring. It is a conspiracy,” he said, alluding to the Arab Spring revolutions that have topped authoritarian regimes in Tunisia, Egypt, Libya and Yemen. Assad paid tribute to his supporters at home, saying they stood steadfastly behind him, and also praised the armed forces. But he criticized the leaders of onetime ally Turkey. In a moment of journalistic unity, the Hürriyet and Today’s Zaman—two newspapers that tend not to agree—agree on one thing: The Annan plan between the government and the opposition in Syria is a failure. But what’s interesting is not the mutual conclusion that the two papers arrive at (the plan was a failure before it began), but the means by which they get there. The Hürriyet tells us: Blasts ravage Annan plan, over 55 killed (here). Today’s Zaman tells us: Damascus suicide bombers kill 55, cease-fire in tatters (here). To both sources, it seems completely natural to say that the ceasefire between al-Assad and the opposition has failed because someone (we don’t know who) has detonated a bomb in Damascus. There was no claim of responsibility for the blasts, but an al-Qaeda-inspired group has claimed responsibility for several past explosions. Shooting could be heard in the background of the Syrian television footage, filmed soon after the blasts. It showed a man pointing to the wreckage. “Is this freedom? This is the work of the Saudis,” he said, referring to the Gulf state that has advocated arming the opposition seeking to oust Assad. Am I missing something? Was the Annan plan brokered between al-Assad and the Saudis? Or was it al-Assad and al-Qaeda? Why are Turkish journalists so eager to dismiss the Annan plan for bogus reasons? I have not posted about the IED-nightmare that Syria has become in the past two weeks simply because it has not been a notable event. As the Zaman suggests, Saudi funds are the likely source of these new developments, perhaps with the aid of Iraqi expertise (here). But whatever the cause of these bombings, rest assured that—as we have seen—Turkish jingoism on Syria is not dead. A brokered peace is no more a possibility than a fair fight. The only question is how long it will be until Syria has changed hands. For the sake of the Syrian people, we can only hope that it happens soon. But at this rate, things aren’t looking too good. I outlined in my last post the reasons to believe that Bashar al-Assad is on the way out. First, the Saudis are now overtly arming the opposition; and second, the U.S. and Turkey are overtly providing “nonlethal” assistance, a vacuous claim in the face of the undoubtedly coordinated effort with Saudi Arabia. The real significance is in the first event, however, which establishes an ethnic Arab mandate for NATO to latch on to. This anti-Assad mandate has only been strengthened today by Syria’s “rejection” of “any Arab League initiative” to end the crisis. Bashar al-Assad, already ostracized by the Arab community, will now be perceived as completely beyond reason. He is, effectively, no longer an Arab. The second event, “nonlethal” assistance, is just a first step toward a now-plausible Plan B—NATO troops on the ground (they’re getting ready). But Plan A is still in effect, and the training, assisting, and arming of the Free Syrian Army (FSA) will continue in Turkey. But even more important will be the training of the Syrian National Council (SNC), which has been officially chosen as the sole representative of the Syrian opposition. Though some assure us that the Syrians are well-equipped for a government restructuring, actions have thus far spoken louder than words. The SNC will have all it can do to convince the world it isn’t just another Libyan NTC. At the moment, though, there is one missing piece. The Turks, the dogs that barked but wouldn’t bite, suddenly seem ready to bite—after a timely meeting from President Obama. But it would be an oversight to say that the Saudis’ lethal assistance in Syria was the Turks’ breaking point. Although the Turks are not ethnic Arabs, and (given their Ottoman past, especially) need the Arab mandate just as much as the rest of NATO, they have also been undoubtedly fearing one particular result of regime collapse in Syria. Most of the opposition factions present signed the statement [to recognize the SNC as the formal representative of the Syrian people] except for a few representatives of Kurdish factions upset over the absence of a reference to a settlement for Kurdish Syrians. So why, suddenly, is Turkey sending its generals to the Syrian border, hosting the SNC conference, and smiling in the face of Syrian anarchy—and unhappy Kurds? I imagine it has something to do with what Obama said during that “one-hour and 45 minute meeting” with Erdoğan. Bashar al-Assad knew that his regime’s collapse would change things in the Middle East. We are about to find out what he meant. Tagged with Arab League, Bashar al-Assad, Erdoğan, FSA, Kurds, Middle East, NATO, Obama, SNC, Syria, Turkey, U.S. The Department of History, United States Military Academy. In 333 B.C., Alexander the Great laid siege to the Mediterranean port of Tyre. It was early in the young Macedonian king’s campaign in Asia, and besieging an island fortress for several months wasn’t in the playbook. But Tyre simply couldn’t be ignored. It was the last Persian port in the Mediterranean—and leaving a Persian navy in the Mediterranean was not an option (as the Peloponnesian War demonstrated). Which is why he sacrificed time, troops, and manpower building a kilometer-long stone causeway to the walls of the city, complete with siege towers and naval support. After more setbacks than he could have anticipated, Alexander breached the walls and concluded the siege, ending Tyre’s service as a Persian port and securing the Mediterranean from Persian naval power. A few hundred miles up the coast and a couple thousand years later, the Syrian port city of Latakia faces a similar predicament—sans siege towers and brilliant generals. Latakia is the new Persian Empire’s (Iran’s) attempt at a naval base on the Mediterranean, and while it may not be as well-established, defensible, or suitable for a large naval presence (yet), it’s a port. Much to Israel’s chagrin, as you can see. Take away Iran’s Syrian port at Latakia and the new Persian Empire will have a hard time projecting power in the Mediterranean. Cue an unstable Syria. The Russians are willing to contribute towards the Iranian port’s defenses and looking forward to cooperation between the Russian, Iranian and Syrian fleets in the eastern Mediterranean opposite the US Sixth Fleet’s regular beat. If anyone knows the value of a Mediterranean port, it’s Russia. Historically denied access to warm-water ports, Russia has never been granted legroom in the world’s oceans. Even now, Russia’s shipping industry relies on Turkish cooperation in the Bosphorus and the Dardanelles. But what Russia does have is a Mediterranean naval port. 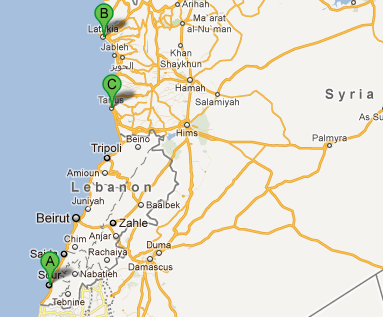 It’s in Tartus, Syria—just south of Latakia. Considerably better developed and defended (complete with Russian surface-to-air missile system), Russia’s port in Tartus will not be given up easily—at least that’s what Admiral Kuznetsov says. So, what this all adds up to is two NATO antagonists with ports in one unstable country. If the Syrian regime falls, it’s a probable BOGO for NATO and anyone who wants unilateral security (in the form of U.S. Nimitz-class supercarriers) in and around the Med. If Bashar stays, the George H.W. Bush might have to do more than “experience the rich history and culture of France” the next time it’s in the 6th Fleet AOR. But it isn’t just naval geopolitics driving foreign pressure against the Syrian regime, either. This is, after all, the Middle East, and no story would be complete without a sprinkling of sectarianism. Or, in this case, several helpings. Iran continues to be complicit in the violence in Syria, providing material support to the regime’s brutal campaign against the Syrian people. Cynically capitalizing on the Syrian government’s growing alienation from its Arab neighbors, Iran is seeking to increase its influence in Syria and help Assad remain in power as a vital conduit to Hezbollah in Lebanon. The problem is that, with the recent U.S. withdrawal from Iraq, Iran will be filling in the political and military void. 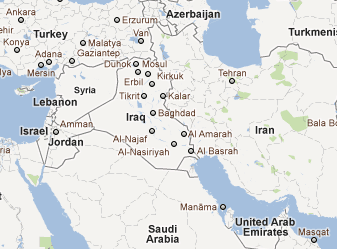 And if Iran retains al-Assad’s Syria as a close ally—well—look at the map. The only thing stopping the new Persian Empire from expanding its Shia-powered influence—continuously—from Iran to the Mediterranean (and to Israel’s doorstep), is a new, unfriendly Sunni government in Syria. All of the relevant actors know this. And if you ask Bashar al-Assad, they’re all doing their best to bring about that Sunni government as quickly as possible. Which leads us to the next question: If sanctions, attempts to undermine the Syrian army, and foreign assistance (training and weapons) for the Free Syrian Army don’t weaken the Iran-friendly regime (or empower the resistance) enough, who will be the first to step in? Turkey certainly stands out for being the loudest, but if it is as the Turks say, havlayan köpek ısırmaz (a barking dog doesn’t bite). Algeria’s Foreign Minister Mourad Medelci said on Tuesday an Arab League committee charged with seeking an end to the violence in Syria had reached agreement with Syrian authorities, Al Arabiya television reported. Arab diplomats said the ministers proposed that Syria release immediately prisoners held since February, withdraw security forces from the streets, permit deployment of Arab League monitors and start a dialogue with the opposition. Either the “deal” isn’t as stringent as it sounds or President al-Assad is feeling threatened all of a sudden. Official announcements to come. But al-Assad, many say, is too slow to update his operating system, and this is reason enough to uninstall. The danger? An “earthquake,” President al-Assad says. “Another Afghanistan,” or “tens of Afghanistans.” In other words, a very unstable operating system. He described the uprising as a “struggle between Islamism and pan-Arabism [secularism], adding: “We’ve been fighting the Muslim Brotherhood since the 1950s and we are still fighting with them” [here]. Why, then, if this is to any extent a struggle between pan-Arabism/secularism (al-Assad) and Islamism (Muslim Brotherhood), is Turkey (secular) supporting the (armed) uprising in Syria? I still maintain what I said in my first post: that Turkey is merely trying to “retain its legitimacy” as a supporter of the Arab Spring. And that’s whether it believes in the Syrian uprising or not.